Cast in bronze is a Polish Eagle on the left hand stone and on the other a Lion Rampant. The tri-stone memorial includes the written dedication in Polish and English in the centre. Details of the wording are shown in the photo on the right. 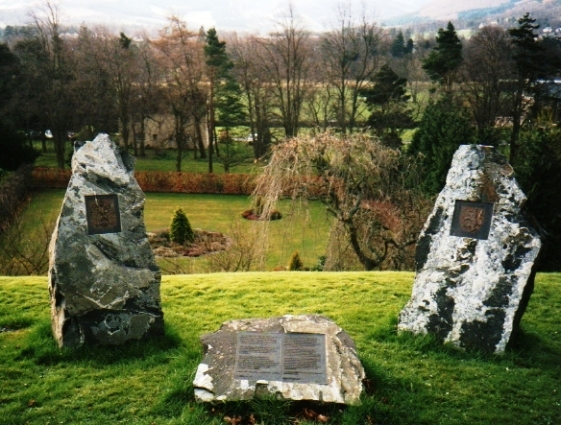 The memorial stands in the grounds of the Peebles Hydro Hotel. This memorial is dedicated to the Polish Forces who came to Scotland during the Second World War to join with British Service Men and Women in the fight against tyranny and the slaughter of innocent human beings. It is also a celebration of the wealth of Polish culture which graces this land, and of the friendship and love shared between the peoples of Poland and Scotland. 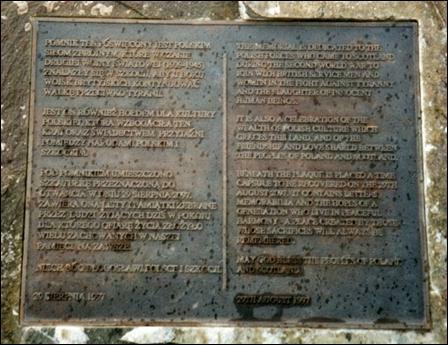 Beneath this plaque is placed a time capsule, to be recovered on 29th August 2097. It contains letters, memorabilia and the hopes of a generation who live in peaceful harmony — a peace created by those whose sacrifices will always be remembered. The Peeblesshire News in the run up to the day of the Polish Tribute featured a number of articles in the paper regarding progress of preparations. Finally, on Friday 29th August 1997, at 11.00 in the morning the march through Peebles returning to Tweed Green began. At 12.30, various dignitaries unveiled the monument and a short dedication service was held. A fly-past of three RAF Tornadoes flew over the Hydro Hotel. In addition to a luncheon, a number of events were laid on in the afternoon. The following year, the organizers of the Polish Tribute were awarded Polish medals from the Polish organization ROPWiM – the Consul General of the Republic of Poland, Mr. Leszek Wieciech presented these to the recipients at a ceremony in Edinburgh. featured an article about the tribute on their 26th October 1997 issue. Five Polish branches of the Polish Ex-Combatant’s Association with their standards, Polish Navy Association as well as a group from the Polish Air Force Association in Scotland took part, alongside comrades from the Royal British Legion, Dunkirk Veteran Association, the RN and RAF Association, Normandy Veterans. The parade marched to music provided by pipes and drums of the 32nd Signal Regiment as well as other Scottish bands.